In the process of updating its fleet of E-3Fs. 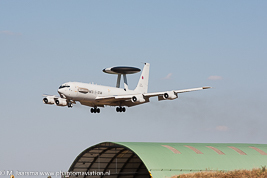 The first AWACS to be withdrawn from use by the NAEW&CF was E-3A LX-N90449 in 2015, the second aircraft followed on December 13, 2017 (LX-N90455). One more E-3A will be withdrawn from service and stored at AMARG at Davis-Monthan AFB, Arizona. 14 aircraft will remain on strenght with the entire fleet upgraded (installation of a glass cockpit) and is expected to servive until the 2030s. 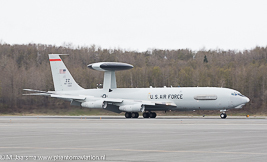 Might purchase the Boeing E-7A (B-737 AEW&C) to replace its Sentries. The USAF is upgrading its E-3B and E-3C to block 40/45 standard. 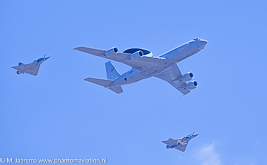 These AWACS are designated E-3G. Air Logistics Complex (ALC) Oklama at Tinker AFB is contracted to upgrade 24 aircraft. Seven aircraft will not receive the upgrade and be withdrawn from service by FY 2019. Flight Global reported nine aircraft to have been converted in November 2015. Five received IOC in July 2015. The 966th AACS is the USAF E-3 training squadron.